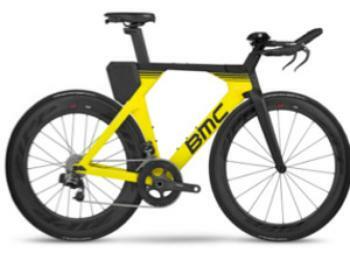 BMC USA of San Diego, Calif., is recalling about 430 Timemachine 01 bicycles. This recall involves all model year 2017 and 2018 Timemachine 01 bicycles and model year 2018 Timemachine 01 framesets. The product is a road bike for triathlons and time trials. BMC is printed on the downtube. Timemachine 01 is printed in glossy black letters on the flat black top tube. The bikes were sold in red, yellow and black. The bicycles, manufactured in Taiwan, were sold at authorized BMC bicycle dealers nationwide from September 2016, through June 2018, for between $7,000 and $13,000. Consumers should immediately stop riding the recalled bikes and contact their local BMC authorized dealer for a free inspection and, if needed, a free replacement fork. Until the replacement forks are available in September/October 2018, the firm is providing consumers with a free 23C replacement tire, if needed, to ensure adequate clearance. Consumers may contact BMC toll-free at (888) 262-7755 from 9 a.m. to 5 p.m. (PT) Monday through Friday, by email at timemachine01_us@bmc-switzerland.com or online at https://www.bmc-switzerland.com and click on the recall on the home page for more information.